1. Gently melt butter, chocolate and syrup in a large pan. 2. Turn off the heat and add the crushed biscuits, marshmallows, cherries and sultanas. You can replace the fruit with pistachio or peanuts. 3. 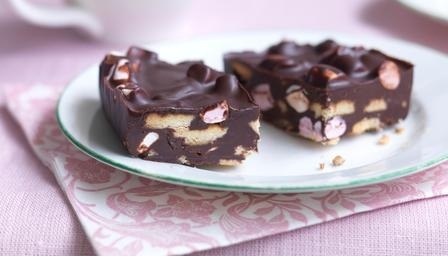 Press the mixture into a foil tray or 23 cm square baking tin. 4. Chill until set and cut into squares.